Teachers, trainers, and other educational professionals have been instrumental in being the torch-bearers for generations of people. They are valuable, in every sense of the word, to the society they belong to because they are the ones who are responsible for making it. It is rightly said that teaching is the profession that teaches all other professions. Preferred Resumes understands teachers' value and offers masterfully crafted education resumes so that teachers can radiate their importance in front of a variety of employers. We excel at transforming ordinary-looking education resumes into exceptional ones. Our professional resume writers specialize in writing resumes for education professionals from virtually every specialty area and any background. 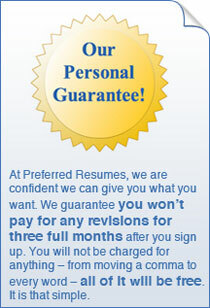 We concentrate on writing exceptional resumes for education professionals and nothing else! Writing a resume does not mean simply creating lists of skills and accomplishments. It is a job best tackled by a professional with considerable expertise. Preferred Resumes's writers have had extensive experience with resume writing, and they keep track of current market trends. They truly understand the impact a strategic and impeccable resume can have on a potential employer or organization whether it is a school, college, university, training center, or any other organization. Our clients put their faith in us because they know we can deliver brilliantly executed professional resumes for teachers, coaches, trainers, professors, and other education professionals. A well-written education cover letter demonstrates your conviction and enthusiasm about the education position for which you are applying. It allows you to make a stellar first impression on your potential employer and spark genuine interest in what you have to offer as a candidate. The quality of your cover letter can mean the difference between getting called in for an interview and being weeded out. Get started with the leader in the resume writing service—Preferred Resumes—now and experience a whirlwind change as an education professional.